With selected Material on Descendants. 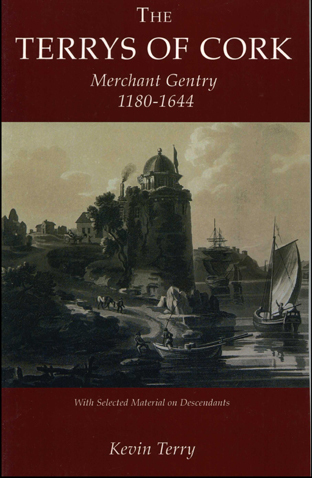 A second book, published September, 2013, by Phillimore & Co Ltd. looks at Terrys of Cork between 1180 and 1644. Selected material on descendants after 1644 is also provided. This includes those who emigrated and settled in France, Spain, Latin America, England, Australia and North America. The book seeks to establish some of the political, social, and economic reasons for their rise to prominence from the 15th century, their maintenance of this position for 250 years, through to their expulsion together with other Old English families in 1644. The book can be regarded as a companion to that published in 2005, Terrys of Cork 1600-2000. 192 pages, 49 illustrations and tables. Based on a M.A. in local history (1st class hons), dissertation from U.C.C. and other research. Attached is a jpeg of the front cover. 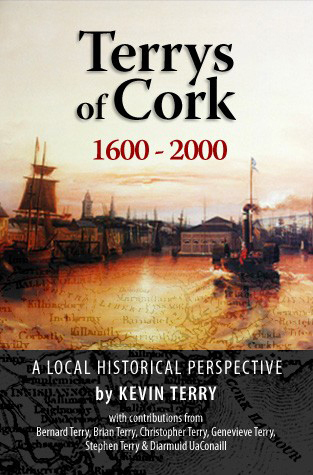 This book, published by Kevin Terry, looks at Terrys of Cork with particular reference to settlement patterns of Terrys in the City, and the Baronies of Barrymore, Cork, and Imokilly, between 1600 and 2000. This area was selected after preliminary examination found that there are instances of close and interchangeable links between urban and rural settlements of Terrys within this area. It will also examine Terrys who emigrated from Cork and settled in a number of other countries. The surname Terry is not a very common name in Ireland; its highest incidence is in Cork. It is of Norman origin and, in former times, Terry families played a significant part in the affairs of Cork City, the only urban settlement where they were prominent, serving as Mayor no less than twenty-two times. The book establishes some of the political, social, and economic reasons for the changes in incidence, distribution and dispersion of the surname over the period. The book looks at the incidence and distribution of Terrys at intervals, about fifty years apart, between 1600 and 2000. It identifies settlement location and numbers of families over the period.